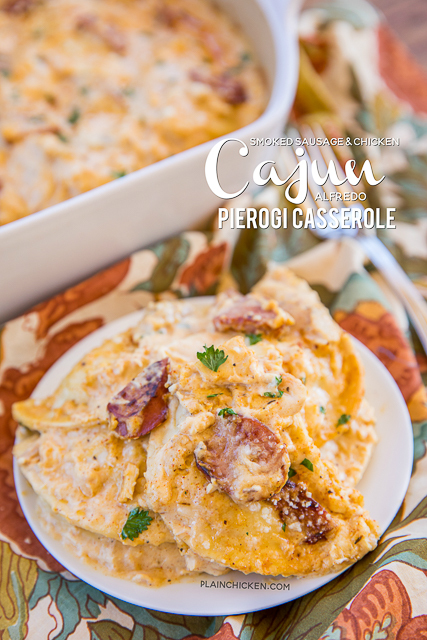 This Smoked Sausage Cajun Chicken Pierogi Casserole is perfect for any upcoming Mardi Gras celebrations! You can make this ahead of time and refrigerate or freeze for a quick meal later. We have made this several times over the past few months and still can’t get enough of it! We just LOVE all the flavors in this casserole. 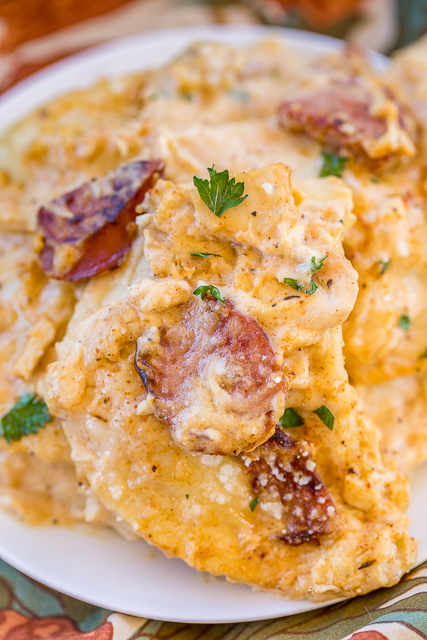 If you are looking to lower the fat and calories in this Smoked Sausage Cajun Chicken Pierogi Casserole, you can use smoked turkey sausage. You could also use some light Alfredo sauce and lower fat cheese. Every little bit helps after all the holiday overindulge. 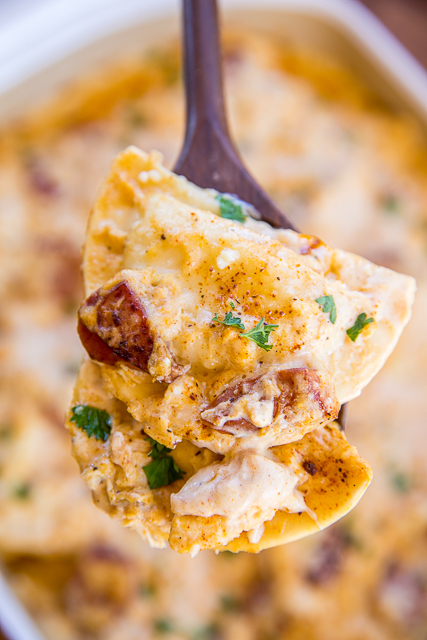 I used a healthy amount of Cajun seasoning in this Smoked Sausage Cajun Chicken Pierogi Casserole. You can find Cajun/Creole seasoning at the grocery store. Look for Tony Cachere brand. I also really like the Cajun seasoning from Penzy’s too. 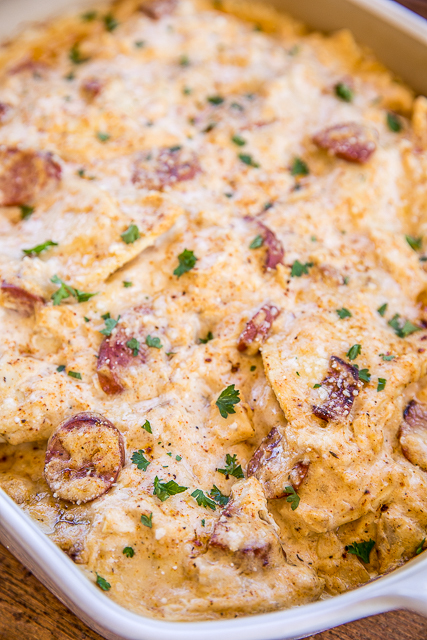 This Smoked Sausage Cajun Chicken Pierogi Casserole was lick-your-plate delicious! We both cleaned our plate and went back for seconds. We already have this on the menu for our upcoming Fat Tuesday celebration. We like to serve this with some Creole Green Beans and a pitcher of hurricanes. SO good! In a skillet over medium heat, cook smoked sausage until starting to brown, about 5 minutes. In a large bowl, combine cooked sausage, chicken, Alfredo sauce, 1/2 cup parmesan cheese and cajun seasoning. Add pierogies and toss to coat. Pour pierogies into prepared pan. Top with remaining parmesan cheese. Very, very, good!! I added a sauteed onion, omitted the chicken, and used a little less Alfredo than the recipe called for. I used Weber N'Orleans Cajun seasoning. Will make again; it was quick, inexpensive, and tasty! Thanks.